LONDON April 16: Legendary poet Vayalar Ramavarma, often known as Vayalar, was a Malayalam language poet and lyricist, born in the village of Vayalar in Alappuzha district. He was awarded the Kerala Sahithya Academy Award in 1961 for Sargasangeetham, the President’s gold medal for best lyricist in 1974, and the Kerala state film award for best lyricist three times. The Vayalar award for Malayalam literature, given on 27 October (the anniversary of his death) each year, was instituted in his memory. 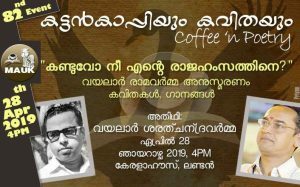 Malayalee Association of UK (MAUK)’s literary wing Kattan Kaapi & Kavithayum or Coffee ‘n Poetry has taken the responsibility to celebrate the great poet by reciting his poems and singing some of those mellifluous songs and making it an evening to remember for years to come. 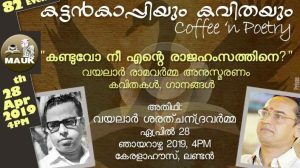 The whole evening will be graced with the presence of Vayalar’s son Vayalar Sarath Chandra Varma who will be the chief guest for the evening too. Vayalar’s son Vayalar Sarath Chandra Varma too rose to fame later on in the years with becoming one of the noted Malayalam film lyricist. 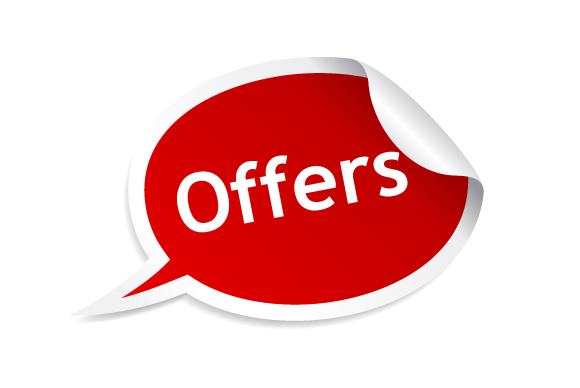 He entered to the lyrics field through the Ayyappa devotional songs by K. J. Yesudas released in 1990. Later, he debuted in films through the film ‘Ente Ponnuthamburan’, released in 1992. 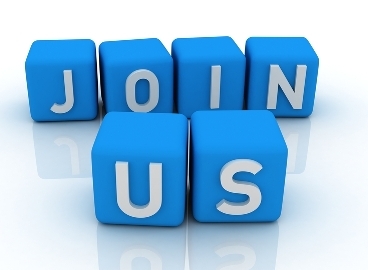 That film had 4 songs composed by G. Devarajan master, his father’s major teammate. But, his career had a break only through the film ‘Mizhi Randilum’, released in 2003. From that day on wards, he is busy in songwriting field. 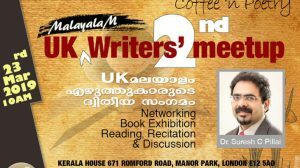 Those aficionados of Vayalar era songs and poems can get in touch with the organisers to hum some songs or recite poems and be part of an event that is sure to be etched in the memory of UK Malayalees. 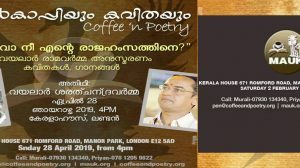 For further details please contact Murali on 07930 134340, Priyan 078 1205 9822 or email pen@coffeeandpoetry.org or visit www.mauk.org or fb.com/mauklondon.